We hire a dredger and end up in jail. This web page comes to you from just outside the "Transportation Camp" (N05.504872 W54.031378) at Saint-Laurent-du-Maroni in French Guiana (made infamous by Henry Charrière aka Papillon). Our journey here from Suriname has been a little complicated and rather expensive!. After we established that the normal ferry across the Maroni river really was out of action until next month, we started looking for an alternative. First we had to establish that French* customs, immigration and police would be happy for us to arrive in French Guiana by non-standard means. To do this we asked Suriname immigration if it was OK for some of us to pop over the river in a dugout canoe without being stamped out of Suriname (our visas for Suriname were only single entry). "No problem". When we arrived at the French side, they could not have been more helpful. Again "no problem" They even made a few phone calls to see if they could find someone able to ship our vehicles across the river. After returning to Suriname and with the help of the head of customs, we eventually contacted a company that had a "barge" nearby that could (for a large fee) take us across the river. There were however several problems. Because the "barge" had no loading ramps, we could only load and unload where the river-bank was at exactly the correct height. Clive and Mick went to see the barge and although it was fine, the road to it and the means of loading were really only suitable for Mog. Even if Mel and K-Nine could get on the barge, there remained the problem of where to unload on the French side. The manager of the company that owned the barge then suggested that we accompany him to inspect a potential landing site on the French side. During the boat trip, it transpired that there might be a boat at the potential landing site that was a better alternative to the barge. And there was! Yesterday evening Mo called the owner of the dredger and in her best French started negotiations. Next morning with another phone call at 06:00, negotiations were completed ($1,800USA in total, $600USA per vehicle) and the dredger set off towards the ferry ramp on the Suriname side of the river where we were parked. 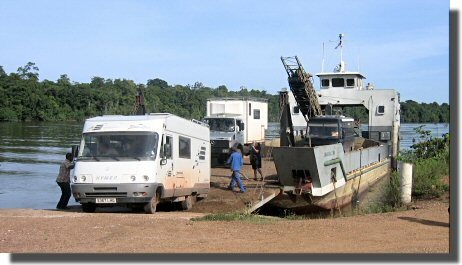 Now all we had to do was clear Suriname customs and immigration before the dredger arrived, and then load all three vans before the tide turned. At 06:15 customs was open, but unable to find the right paperwork. Immigration was still closed. By 07:00 the barge had arrived and the owner was very keen to start loading. Still no sign of immigration. The customs paperwork for leaving Suriname was simply ignored and Mog and K-Nine managed to reverse onto the dredger without difficulty. 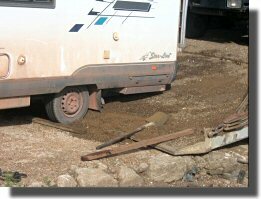 Mel however grounded when reversing up the ramp, with the rear chassis member lifting the rear wheels off the ground! At 07:15 immigration arrived and "the girls" worked on getting us all stamped out of Suriname whilst "the boys" tried to get Mel onto the dredger. Except that with the delay, the tide had turned and the front of the dredger was now stuck on the concrete loading ramp. After fifteen minutes of manoeuvreing the rear of the dredger from side to side, we eventually pulled free of the loading ramp without damage. Not surprisingly the owner and captain of the dredger were not keen to risk getting it stuck on the ferry loading ramp on the French side. So they opted to dock at the company's own ramp, about 7kms up river. This of course meant we would be bypassing French customs, immigration and police! Once again Mo used her cell phone and best French to reassure the police that we were not trying to smuggle the vehicles into French Guiana. After about 40 minutes we docked on French soil (well French gravel anyway). Once again Mel had to be assisted off the ramp, this time using the owner's pick-up truck. 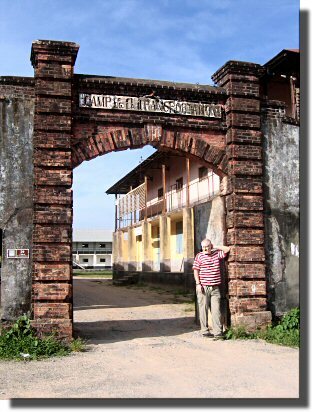 We then drove the 7kms back into Saint-Laurent-du-Maroni to immigration and customs. Even though we arrived from the "wrong" direction, immigration just stamped us into French Guiana without comment. Customs were a little surprised that we had managed to import three large vehicles when the ferry wasn't running, but then informed us that since French Guiana is part of France, there were no customs formalities for campervans from the UK (just like landing at Calais from Dover). The only complication is vehicle insurance. We can not establish if insurance is compulsory in French Guiana. Suspecting that it is, we tried to buy it in town only to be told by one company that they only insured French registered vehicles and a second company telling us they were closed for the month! *French Guiana really is part of France. You drive on the right. The cars have French number plates. The supermarkets sell French wine and Champagne. You pay in Euros. The excellent boulangerie-pâtisserie closes from 12:00 to 15:30. The restaurants are superb. And of course, everybody speaks French. Whilst trying to find customs, we noted a large parking area just outside the "Transportation Camp" (the town's main tourist attraction). We have had a guided tour of the jail (in French of course) and plan to spend the night there. We will also sample one of the restaurants in town.